This is the second of many blog posts under the label of Bio-mechanical Discussion Points that has been sparked by the wonderful books from Dr. Kevin Kirby. For me, I need to be able to draw a line on the back of the heel that represents the bisection of the heel. I am sure my measurement is only accurate within a few degrees. I am trying to have a line represent an entire heel bone and I try to do this the best as I can. I should be able to draw the same line with the patient prone or standing. It is one of the basic skills taught podiatrists. 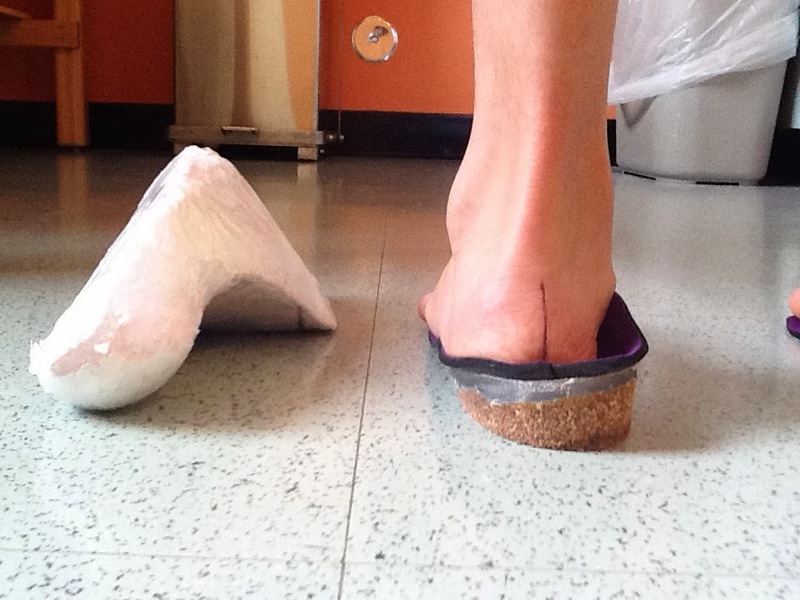 I use the heel bisection to see how my orthotic devices are helping, or if more correction is needed. This right foot is everted to the ground . 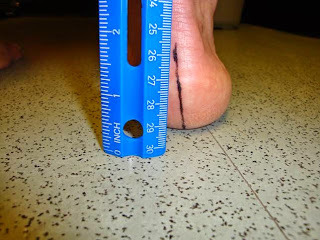 I use a bisection line that I was taught in Podiatry School, to represent whether the heel bone is everted to the ground, vertical, or inverted to the ground. Then I can check (be honest) if my orthotic device is helping make the foot more stable. You should first look at the back of the heel and decide if it is everted, vertical or inverted. Then draw your line and see if you captured this heel position. If you are performing this at orthotic dispense, then this should correlate to what you see in gait. Or, you just keep learning. 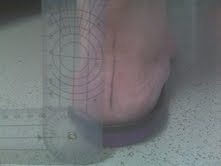 Here a goniometer is being used to measure the degrees at the heel. Of course, when we are designing orthotic devices, we try to make everted heels generally less everted, vertical heels inverted when the foot is pronated, and inverted heels generally less inverted unless there is significant rearfoot varus conditions.